I thought it was high time for some new crochet hats for the residents of Tea Towers. 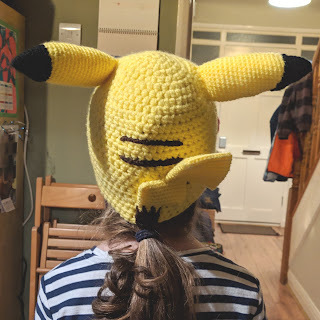 After much pattern searching it seems that Pokemon are still very much in Emily and Sam's hearts so I started on a Pikachu hat for the cheeky one. She was also very clear about the level of detail she required and made sure to check in with me that I had all the materials I needed - 'Don't forget that you need red wool for the cheeks..', 'it needs to have brown stripes on the back Mummy, don't forget'. Sam took a lot longer to decide on what he wanted. 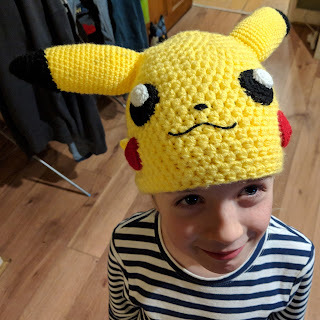 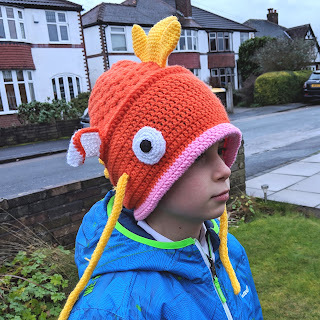 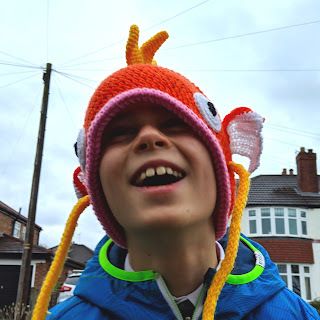 He still wears the crochet hat I made for him 5 years ago... it still fits and is super snuggly and has almost become his trademark at school, so he only wanted a hat that would continue to be as noticed.